Trumpet Chris is the Principal Trumpet of the Kentucky Symphony, the Hamilton-Fairfield Symphony, and the Lebanon Symphony Orchestra, as well as performing and recording as an extra with the Cincinnati Symphony, Cincinnati Opera, and Cincinnati Pops, has performed with Ray Charles and Doc Severinsen, and as a soloist with the KSO and CSO. Chris founded the group in 1979 with former horn player Dennis Hanthorn [currently General Director of Atlanta Opera Company]. Realizing the need for arrangements of different styles of music for brass and with the help of several grants from the Fine Arts Fund in Cincinnati, Swainhart arranged many of the quintet's signature tunes, and continues to add to its repertoire. Chris has served on the faculties of Northern Kentucky University, Transylvania University, Xavier University and Asbury College. Trumpet Brian was the former Second Trumpeter of the State of Mexico Symphony Orchestra and now performs and records regularly with the Cincinnati Symphony and the Pittsburgh Symphony Orchestra. He has also performed with the Seattle Symphony, Indianapolis Symphony, Louisville Orchestra, Colorado Symphony, West Virginia Symphony, Lexington Philharmonic, Queen City Brass and the Burning River Brass. Aside from his skills as a trumpeter, his published arrangements for brass ensemble and brass quintet have been played and recorded by such groups as the Canadian Brass, Summit Brass, Bay Brass, Washington Symphonic Brass, Queen City Brass, Canterbury Brass and the New World Symphony Orchestra. He has received extensive conducting experience with the Kentucky Symphony Orchestra, Music Academy of the West, CCM Brass Choir and the Duquesne Contemporary Ensemble. Brian is currently a freelance trumpeter in the Greater Cincinnati Area and serves as Second Trumpet with the Kentucky Symphony Orchestra. Vincent DiMartino Trumpet Known internationally for both his jazz and classical playing, Vince DiMartino is one of America's most versatile trumpet performers and teachers. DiMartino has performed with popular artists such as Henry Mancini, Doc Severinsen, Pearl Bailey, Dizzy Gillespie, Dave Brubeck, Chuck Mangione, Clark Terry, and Lionel Hampton, and he has appeared as soloist with numerous symphony orchestras, including those in Cincinnati, Buffalo, Santa Fe, Orlando, and Rochester. He is prominently featured on many of the recordings of the Cincinnati Pops Orchestra, and recently completed a tour as a featured soloist with the Boston Pops Orchestra and conductor Keith Lockhart. In 1993, following a distinguished twenty-year career at the University of Kentucky, DiMartino accepted his present position as the W. George Matron Professor of Music at Centre College in Danville, Kentucky. DiMartino has worked as a clinician and soloist with more than 150 colleges and universities. He was recently elected president of the International Trumpet Guild for the second time during his career. Trumpet Steve joined the Queen City Brass in 1980, the same year in which he wasappointed 2nd trumpet with the Cincinnati Symphony Orchestra under Michael Gielen. Since then he can be heard on over 100 recordings of the CSO and Pops. He also has performed as a soloist with the Cincinnati Symphony, Pops and other orchestras and bands, as well as on the CSO's chamber music series. Steve has served on the faculties of Miami University and Northern Kentucky University. Steve also performs as solo cornetist with the Frank Simon Band, which is dedicated to preserving the tradition of the revered cornetist/conductor Frank Simon. Trumpet John Rommel serves as Professor of Trumpet at Indiana University and was principal trumpet of the Louisville Orchestra (1988-1996) and has performed throughout the United States, France, and Germany. His numerous solo performances include recent performances of the Bach Brandenburg Concerto No. 2 and David Gillingham's When Speaks the Signal Trumpet Tone. He has recorded more than 30 compositions with the Louisville Orchestra by many of the leading composers of the twentieth century. His chamber music experience includes performances with Summit Brass, Saint Louis Brass Quintet, and the Nashville Contemporary Brass Quintet (1980-1988). Mr. Rommel has extensive commercial recording experience in Indianapolis and in Nashville, Tennessee. He was a clinician for the Vincent Bach Corporation, a division of the Selmer Company, and was a student of William Adam, Louis Davidson, and Leon Rapier. He undertook additional studies with Vincent Cichowicz and William Scarlett. Horn Charles Bell plays Horn with the Cincinnati Symphony. Horn Member of the Dayton Philharmonic since 2002 and formerly with the Louisville Orchestra, Amy has played regularly with the Richmond Symphony, Columbus Symphony, Cincinnati Chamber Orchestra and the Cincinnati Symphony Orchestra. Amy has served on the faculties of the College of Mount St. Joseph and the Cincinnati College-Conservatory of Music. Trombone Former Principal Trombone with the Montreal Symphony Orchestra, Peter Norton currently plays Bass Trombone with the Cincinnati Symphony. Trombone Tim Anderson has been the Principal Trombonist of the Dayton Philharmonic Orchestra from 1994 to the present. Previous orchestral positions include the West Virginia Symhony Orchestra (Charleston, WV) and the Cleveland Opera and Ballet Orchestras. He has also performed with the Cincinnati Symphony and the Cincinnati Pops Orchestras, and he appears regionally with bands and orchestras as a solist and clinician. Tim is currently on the faculty of the University of Dayton. 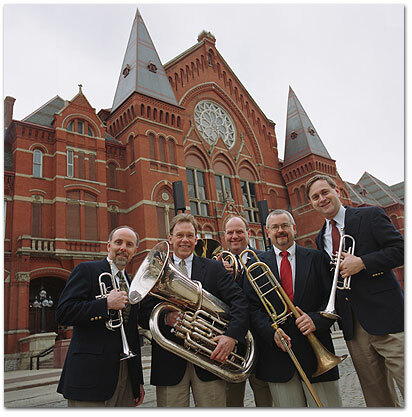 Tuba Mike has been Tubist with the Cincinnati Symphony since 1976. In 1982 and again in 1988 he performed the Vaughan Williams Concerto for Tuba with the CSO on tour. In 1982 he recorded a solo tuba album which included the world premiere of The Seasons by Frank Proto. In 1992 Mr. Thornton premiered yet another tuba concerto by Frank Proto with the CSO under the direction of Maestro Jesus Lopez Cobos. While at Yale Mr. Thornton was the assistant conductor of the Yale Wind Ensemble and conducted works by Charles Ives in Finland the Kennedy Center in Washington, D.C. He has taught tuba ant the University of Kentucky, Xavier University, Northern Kentucky University and the College of William and Mary and is currently on the faculty of Miami University. He has performed tuba recitals all across the US. For the summer of 1998 he has been invited to perform ant the Flathead Music Festival in Montana and the Aspen Music Festival in Colorado. Tuba Tim Olt is principal tuba of the Lima Symphony Orchestra and is a member of the professional tuba quartet All the King's Tubas. He also has performed with the Cincinnati Opera Orchestra, Cincinnati Symphony and Pops Orchestras, and the Tallahassee Symphony Orchestra. He is currently on the faculty of Bowling Green University. Tuba Walt Zeschin is former Principal Tuba with the Colorado Symphony, and is currently Personnel Manager of the CSO.